Optimizing a website or app for optimal user experience takes a special skill. And those who can do this extremely well are paid enough for their matching skill set. But in order for a graphic designer to get to that level, he or she needs to learn the relevant UX design skills and then apply this knowledge through various jobs. And to get those jobs, designers need to be well-versed in promoting themselves first. One good way to be remembered for your skills at the same subtly promote your services and get a job in the process is through the use of a well-designed email signature design. So if you want to explore the possibilities of using this novel approach to get more project opportunities as a UX/UI designer, make sure to read until the end of this article. We will provide multiple examples of email signature templates that will fit the job description of a UX/UI designer. In addition, we will also share tips on how to best choose a signature template design that will fuss most graphic artists’ needs. Embedded below are multiple examples of UX/UI designer email signature templates. These pre-made templates are available in Adobe Photoshop and HTML file formats. Email signatures are digital template files that will contain all the design and formatting elements needed to create the signature line that will automatically be added in your email correspondences. Most email providers now support this kind of automated email signatures so you do not need to worry if the code or formatting for the signature template shows up well on your emails or not. But if you are still on the fence on getting an email signature, let us help convince you even more. We have listed down the top practical reasons why it makes sense to get your own email signature template. Read a list of these benefits below and find out how the use of simple email signature designs can make your life easier. You can also like outlook email signature templates. Writing emails is just like writing letters. 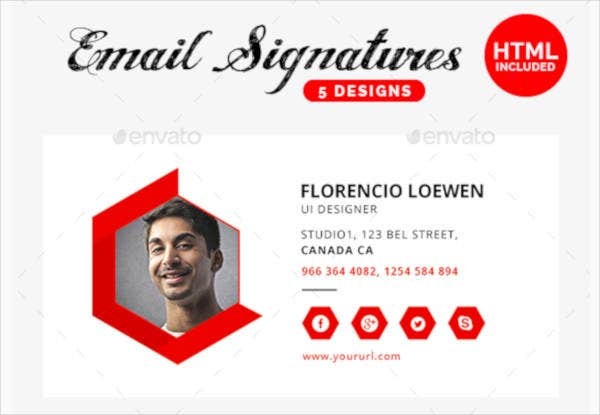 And just like how people would choose elaborately designed stationery sets and envelopes for their own letters, the same thing can be achieved online when you use pre-made email signature templates. These simple digital signature templates allow you and your letter’s content to stand out more since your email is now bookended by a well-designed signature line. Where the traditional signature line only featured the sender’s name and designation, the modern email signature design allows its users to condense as much personal information as possible. For example, you may now add your contact information, social media profile links, website links, and even your own photos into the signature line. All these things will make your emails stand out to its readers. And this is a good thing if you want people to know what you do and how they can hire you. Using email signature templates that primarily indicates your job as a UX/UI designer can be a perfect tool to showcase an intentional personality. Remember, you want to get new clients and more work opportunities. Therefore, you should do everything in your power to attract an abundance of job offers. Customizing your own email signature template is one small thing that you can do that may lead you to more job opportunities. Another reason why it makes sense to create your own email signature design is to showcase your own creativity. When you craft an original and captivating email signature design, people reading your email are more likely to ask how or who created the signature template. Clients are more likely to hire you if they are already seeing your creative and hardworking side. You can also check out these sales email signature templates. As with other kinds of email signatures, these tiny email additions can also help increase your own credibility. This especially applies to those who use their own name, contact information, social media profile links, and website links in their email signature templates. Designers who are transparent with their professional profiles are more likely to be trustworthy enough and, therefore, they will also have more chances of being hired for a project/s. Another practical reason for using pre-made UX/UI designer email signature template designs is their ability to make any email appear more organized and presentable. We all know that email writing should be like letter writing. And if you want all your digital correspondences to appear as neat and organized like all the other formal letters that you send out, using email signature designs can be a good start. When an email has a digitized signature line, the end of an email will be clearly distinguished from other forwarded messages and email replies. This tells our brain that all information has already been shared on the upper portion of the letter and anything found after the signature line will be considered unnecessary and a waste of time. You can also read college student email signatures. Those are the top 5 reasons why it makes sense to get a customized email signature. 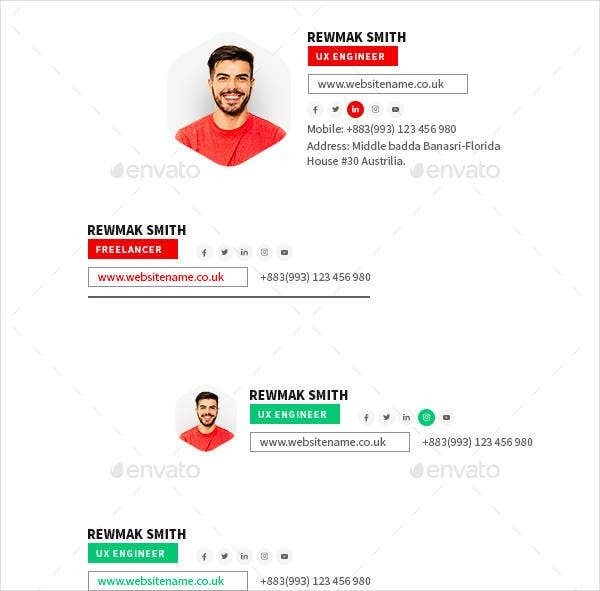 With the help of all the template examples embedded within the article, we hope that you will more than ready to craft your own email signature design. You may also like formal e-mail signatures. To make sure that you only create the best UX/UI designer email signature design, it is important to choose a well-designed email signature template as well. With the many choices that this article and the internet, in general, has to offer, the template selection process can easily become overwhelming. You may also like corporate email signatures. That is why we have listed the most important questions that any UX/UI designer should ask themselves before they purchase and download any kind of email template designs. 1. Is the email signature template customizable? The first question to ask before selecting an email signature template is whether the template is customizable or not. You need to know if a template is customizable or not since you will need to add your own personal information to the template. And you can only do this if you the template is editable. You may also see personal e-mail signatures. 2. What is your preferred email signature design theme or motif? Another important criteria before you download an email signature template is the template’s theme or motif. 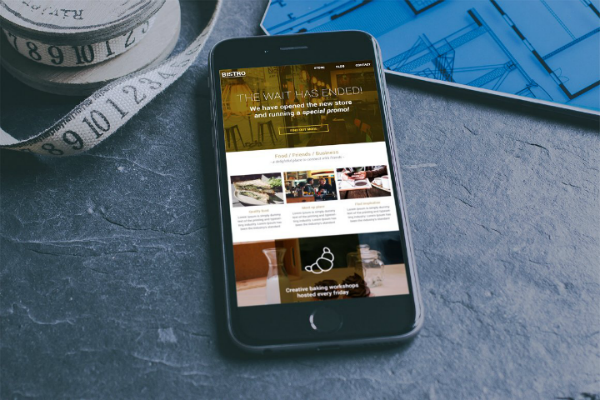 A unified template theme allows all your email correspondences you to match with your personal and business branding image. The more your email signature design complements your personal branding theme, the more trustworthy your personal image as a freelancer gets. 3. Does the email signature template have a responsive design? Before you download an email signature template, it is important to check if the template of your choice has a responsive design or not. Responsiveness in design means that the email signature will show up without a hitch in any kind of display screen from mobile phones to computer screens. You may also see these responsive email templates. 4. How much time do you have before you need to roll-out the new email signature design? It is also important to ask yourself if you have enough time to complete the creation of your new email signature design. For example, if you have two or three months to find and create a new email signature, you can always take your time designing all the aspects of the email signature. However, if you are pressed for time, you may just have to delegate the template editing task. Or, you may just choose a pre-made email signature template that will not require a lot of customization to help you save time. You may also see business email signature templates. And that ends this short guide on what questions to ask yourself before you start creating your own UX/UI designer email signature design. Read all these questions repeatedly if you want to make sure that they stick to memory. Also, you can always refer back to this article if you feel that you need a guide on how to properly choose a good email signature template. Looking for pre-made templates that will work well with Gmail? Check out these Gmail email signature templates. Whether you are creating a medical email signature design or you are looking for an email signature that matches your job as a real estate agent, the most important step into fully using these digital templates for your email is just to start doing it. Schedule a specific time and date for you add incorporate your new UX/UI designer email signature design. Most email providers allow you to do this quickly by inserting a few lines of code on a specific section in your email account’s settings page. And for those who want to take a look at other kinds of email signature templates and designs, feel free to browse through our website. 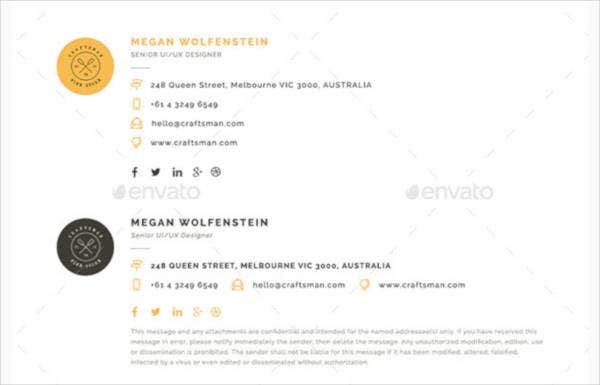 Seek inspiration from these templates designs until you are motivated into selecting the best email signature design for yourself. You can also like IT email signatures.